There’s a heart-pounding scene in Still Alice when the main character, Alice Howland, gets lost while jogging in familiar terrain. Then comes a heartbreaking scene when Alice, played by Julianne Moore, gets lost in her own home trying to find the bathroom. After opening door after door, her husband, played by Alec Baldwin, finds her standing in the hallway. She’s crying. And she’s wet her pants. Then Alice, a scholarly linguist, gets lost in her own words while giving a speech in the movie. The movie portrays a deep fear that comes with aging: the once-familiar will become foreign. Memory loss can be typical with age, but that doesn't necessarily mean it's a normal or a healthy part of aging. In the early stages of cognitive decline or dementia, people may start to get lost more often. When memory begins to affect your parent's daily living, it's dangerous. And if it’s dementia, or most specifically Alzheimer’s -- like what the character Alice was diagnosed with -- it will only get worse over the months and years to come. A medical professional should be consulted for a complete diagnosis. There are many skills you can learn to help your parent, from creating structured routines and simple lists to asking for help from professional caregivers who are experienced in caring for those with memory loss and wandering. But when Mom or Dad starts getting lost, it’s time to act. Lists are good reminder visual cues. Keep lists of daily activities as well as those for shopping and other tasks. A list does not need to be extensive to be effective. A few items on a grocery list or a prompt on when to eat meals is all that is necessary. Mark off tasks as they are completed. Create a wall calendar for one-off tasks or weekly reminders that include such things as meetings, doctor’s appointments or when to mail the bills. Write legibly. Sticky notes are your friends. Use sticky notes where a reminder is necessary. For example, stick a note near the front or back door that simply says: wallet, keys, coat, hat. Keep a note in the bathroom with prompts such as "brush teeth," or 'take shower." Alarms aren’t just for waking up. Set up alarms throughout the day as an auditory reminder to take medication. Keep pills in boxes with days and times marked and easy to read. Encourage your parent to journal or keep notes in a booklet on what he or she did during the day and then go over the activities. The Alzheimer’s Association has developed tips for daily life and to help minimize wandering. Create a structured, task-oriented daily schedule and stick to it every day. Break it down by morning, afternoon and evening. See a sample here. Identify the times that wandering is most likely to occur. Plan activities for those times. Doing so will lower your mom or dad’s stress and anxiety. Keep car keys as well as door and window locks out of sight. Also keep shoes, coats, hats and suitcases (signs of departure) away from the door. Consider installing locks at the top or bottom of doors or windows. Put a small bell at the top of doors, or a more elaborate alarms system, that sounds when the door is open. If your mom or dad can still drive, consider installing a GPS device in their car or keeping GPS activated on a mobile device. Are they hungry or thirsty? Do they have to use the bathroom? Ask the questions. Large, loud and unfamiliar places can create anxiety and disorient your parent. Avoid places like the shopping malls and the grocery stores at busy times. If wandering has been an issue in the past, make sure your mom or dad is supervised at all times. Don’t lock him or her in at home unattended, especially with a working car in the driveway. A professional caregiver can assist you during these times to be the extra set of eyes and ears that is often necessary. Recognizing that wandering is common with Alzheimer's, there are several things you can do now to get prepared for that probability. The National Institute on Aging and the Alzheimer’s Association says that preparing will help provide you and your parent some peace of mind and help you focus on daily living routines. Think of these tips as your just-in-case toolbox. Have an ID tag or medical bracelet made for your parent that is worn 24 hours a day, seven days a week. Include name, Alzheimer’s diagnosis, and provide emergency contact information, including your parent’s address. Alert neighbors and local police that your parent has Alzheimer’s and may wander. Give them your number and ask them to call or text immediately if they see him or her outside and alone. Attach labels inside all clothing with your parent’s name and contact information. Keep an article of worn, unwashed clothing in a plastic bag just in case authorities need to use specially-trained dogs to find your parent. Also, keep a current photograph and video recording of him or her to help police. A leftie or a rightie? Make note if your parent is right or left handed. Wanderers tend to travel in the direction of their dominant hand. Keep a list of your parent’s favorite or familiar places, like a former home, job locations, a favorite park or fishing hole. Consider enrolling your mom or dad in the MedicAlert® + Alzheimer’s Association Safe Return® Program (call 1-888-572-8566 to find the program in your area). If it sounds like there are lots of measures to take, it’s because there are. This isn’t easy. And it’s what makes a professional caregiver such an incredible resource. 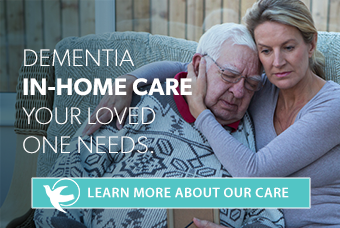 Learn more about home care for patients living with Alzheimer’s and dementia by clicking here .